Edinburgh is a very photogenic city, the kind of place where it might once have been nice to buy a post card for a close friend or relative. People hardly ever send post cards anymore. (This should be said somewhat whimsically.) People hardly ever send post cards anymore; instead, they take a quick picture on their ‘phone and dispatch it by some mysterious means to their nearest, dearest and 189 assorted casual acquaintances: “Hi guys – here I am in the middle of some kind of creek. Cool! LOL :-)” So, as more thoughtful writers have observed, posterity will be denied an invaluable historical resource. Aside from the really useful information written on the back of post cards (“Weather is here, wish you were lovely”), the pictures are, obviously, contemporary snap shots – in more ways than one. 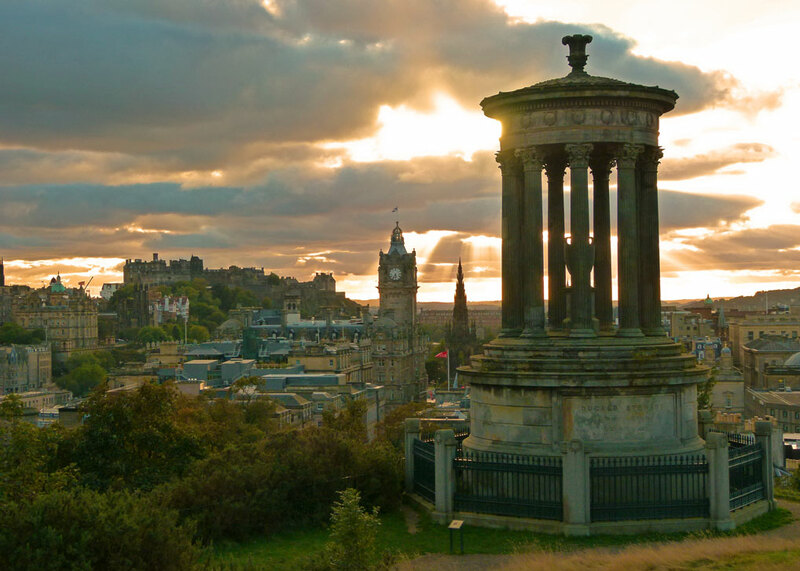 But if you were going to send or receive a post card from Edinburgh, the classic view of the city from Calton Hill wouldn’t be a bad one to choose. Or you could pop up there and take a quick snap on your mobile ‘phone – if you haven’t already done so whilst I’ve been rambling on. 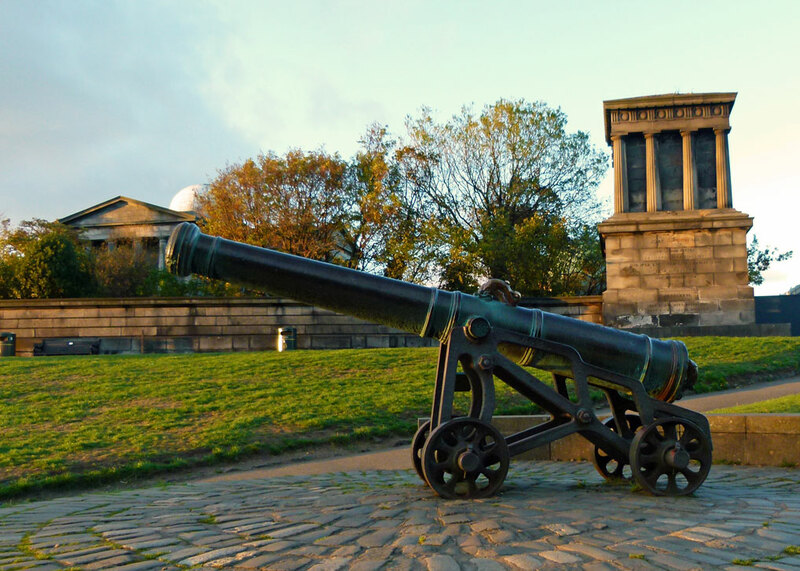 Calton Hill, at the east end of town, is a landmark that has long been common ground for Edinburgers. It’s actually included within the boundary of Edinburgh’s World Heritage Site and it’s used for casual strolling (in daylight hours), as well as for high days and holidays – such as the City’s Hogmanay fireworks and the revived ‘traditional’ Celtic Beltane Fire Festival at the end of April. From the top are panoramic views: west over the City are landmarks like the baronial Balmoral Hotel, the Waverley Memorial, the crown steeple of St Giles’ Cathedral and, beyond that, Edinburgh Castle; to the north is the Firth of Forth and Edinburgh’s port, Leith – you know, the place they had sunshine over – and to the south-east, the Palace of Holyrood and Arthur’s Seat. 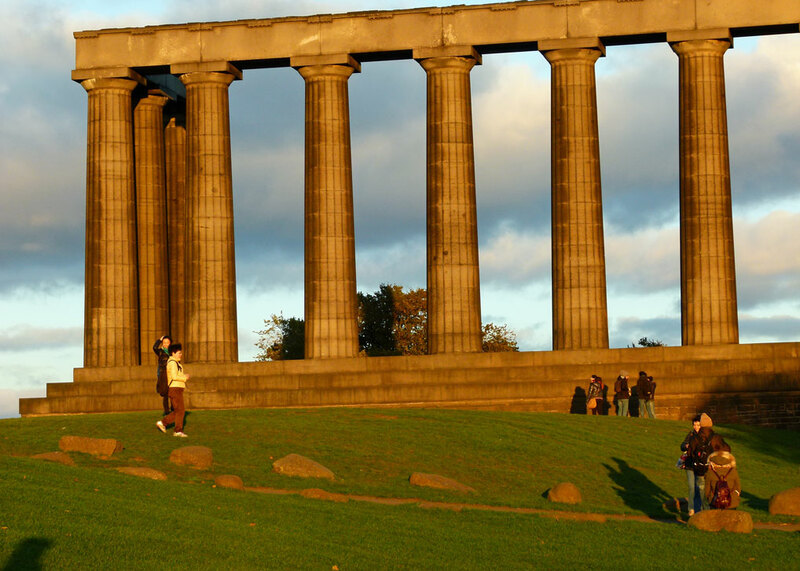 So visitors to Edinburgh go to Calton Hill to take photographs. And they go to see its monuments and other buildings. These date from or were inspired by the age of enlightenment, a time of cultural and scientific revolution when Western Europe allegedly threw off the intellectual shackles of the past. Having said that, much of the architecture of this period has classical influences, which suggests to me that people were looking backwards as well as forwards; but what do I know? Anyway, the National Monument, inspired by the Parthenon in Athens, was intended to honour all Scottish servicemen who perished in the Napoleonic Wars (1803-15). Construction began in 1826 but, unfortunately, the cash ran out – displaying a stunning grasp of public project planning equal to anything in modern times. It was never completed and has subsequently been called “Scotland’s Disgrace” as well as other understandable names. Whilst on the subject of successful public projects coming in on time and on budget, you’ll find the Scottish Parliament Building not far away. The Nelson Monument, erected by the grateful citizens of Edinburgh (that’s what it says), commemorates one of Britain’s greatest naval heroes, Admiral Lord Nelson, and the victory over the nasty French and Spanish at the Battle of Trafalgar (1805). The design is allegedly based on Nelson’s telescope and the views from the top are reputed to be spectacular. Close by, you’ll find an 18th century cannon, probably Spanish originally, captured when the British invaded Burma in 1885. 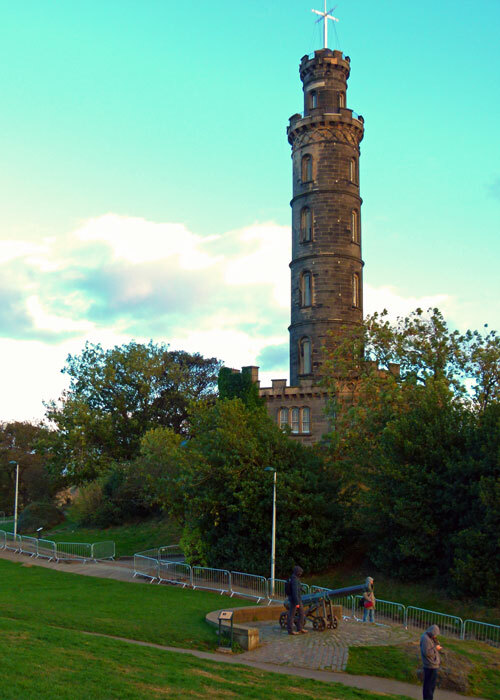 But the monument that seems to feature in all the pictures from Calton Hill is the Dugald Stewart Monument. In case you’ve not heard of Dugald Stewart – and I’m really surprised how many people haven’t – he was a Scottish philosopher and professor at the University of Edinburgh, born 1753, died 1828. He was evidently a bright spark, sufficiently respected at the time for someone to want to remember him with an enormous Greek-style erection, and even has a building named after him at the University today. Yet his contribution to the world, so far as I can make out, is now largely in the form of the attractive monument that bears his name. I bet it’s sold a few post cards in its time though. Beautiful photos! I went up Calton Hill because I ran out of time to do Arthur’s Seat, and was pleasantly surprised by how nice it is up there! So happy to have discovered your wonderful blog! I guess I’ll have to thank Joy for that! I’m still of the old school and send postcards and write letters. Isn’t it nice to get something handwritten in the mailbox now and then? What stunning gorgeous photos. I have never been but would love to travel there one day. Thanks for dropping in, Tina. Yes, I like sending post cards too – though I’m in a minority! Beautiful light for photography. If I were a post card photographer, I’d definitely spend time there. 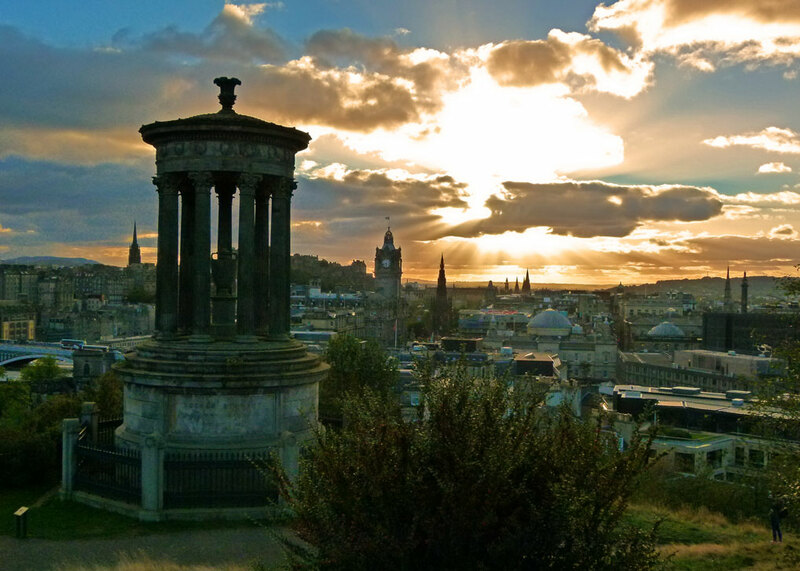 One of our favourite cities, though we haven’t visited Calton Hill. Dugald Stewart may not have made an original big contribution to Scottish philosophy, but he did popularize the works of Adam Smith and others through his teaching and writing, making the Scottish Enlightenment better known. Not surprising that the public remembers a tangible monument better than a philosopher’s words! Never been there but may go one day. As to postcards I do send them, always have. I plan ahead and print addresses on labels so I don’t have carry the address book. This year the postcards were free on our river cruise. I sent lots. Impressive! I have a very dear friend in the US who is really good at sending postcards. I confess I’m not that well organised! My nephew was recently in Edinburgh enjoying the Fringe Festival. He sent my ageing mother a postcard with all his news. A dear boy! My sister (his mother) says he’s ‘jammy’ and knows how to please his grandmother. It sounds like your nephew has a brilliant future ahead of him! I really like Edinburgh. It’s also a great cycling city with traffic free cycle tracks to every area and a cracker along the flat sea front esplanade from Cramond to Leith Docks. As you are already standing on a hilltop with unrestricted views the view from the top of The Nelson Monument is not much different but its only a couple of quid to get in. Blackford Hill and the Hermitage are also worth a visit as is Arthur’s Sofa. Missed seeing Edinburgh from up on high so I guess I’ll just need to plan another trip in the future. It’s a great city to wander about in. Yeah – we got lucky! Sad but true about postcards. Your photos would make great postcards! Of course I couldn’t resist Googling Dugald Stewart and found that as a philosopher he expounded Scottish Common Sense Realism. Philosophy always seems a bit short on both realism and common sense so I applaud his contribution, whatever the finer points of it might be. A magical place! I’d enjoy spending time there. Indeed an incredible place, such rich history and these views, especially the first shot, just lovely. That clock tower is something too! Is that really a signpost on the top of Nelson’s monument? It’s a time-ball, Brian (I had to look that up!). Back in the fifties, Mum & I would go to London with Dad and send a Post Card to my Grandmother – in N 15 – saying that we would see her in the afternoon. Posted around nine am, delivered by lunchtime and that was on a Saturday! Almost as good as the then Telegram Service. Smiley Face. I too remember when the postal service seemed so much better than it is now – we certainly expected items to be delivered the next day. And the volume of mail must have been greater – no texting, emailing or facebook in those days!